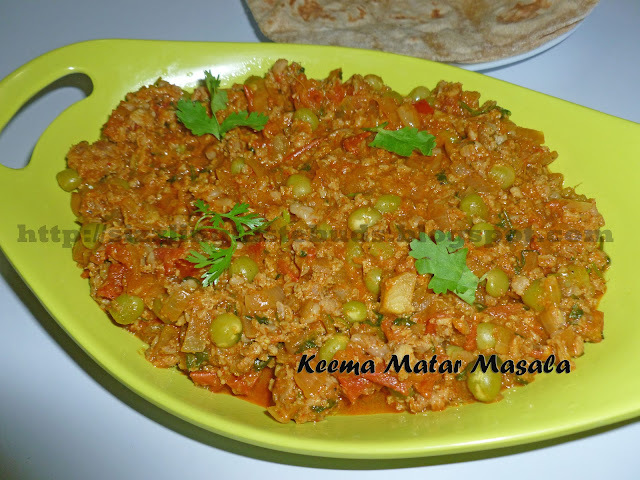 Chicken Keema Matar Masala is one of the easiest and a great combo with chapati's or Roti's. As the name indicates keema and matar( green peas), the dish is prepared with a great combination of minced chicken with green peas. This can also be made with minced meat(mutton). It was a long weekend this time and I tried out this awesome delicious Keema Matar for Sunday dinner and the family enjoyed this with hot hot chapati's. 1. Boil peas with little salt and keep aside. 2. Heat 2tsp of oil in a kadai. Add chopped onions and fry till they turn slightly golden in color. 3. Add ginger- garlic paste and saute for a minute. 4. Add chopped tomatoes and fry till they become soft. 5. Now add boiled green peas , keema and all the dry spice powder mentioned. Pour in little water and mix. Cover it with a lid and cook till keema is well cooked and until oil separtes. 6. Mix it well and add chopped fresh coriander leaves.